Christopher M. Richardson, 27, of Ashley, was sentenced to four years in prison after pleading guilty to one count of aggravated arson, a first-degree felony. He set fire to his home in Ashley on Jan. 28 of this year while his mother was still inside. She survived. An Ashley man who pleaded guilty to burning down his home in January, while his mother was still inside, has been sentenced to four years in prison. 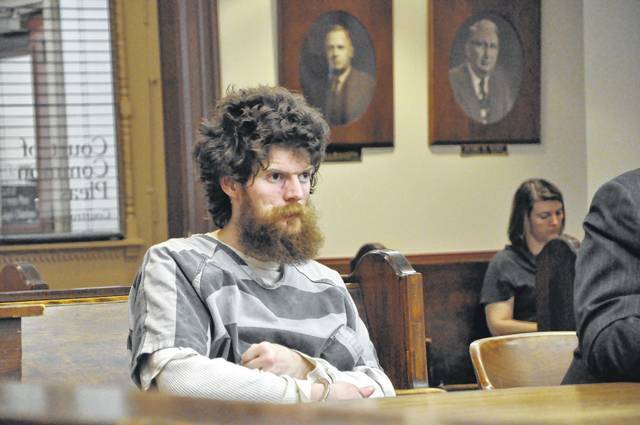 Christopher M. Richardson, 27, appeared in Delaware County Common Pleas Court on Wednesday to be sentenced for one count of aggravated arson, a first-degree felony. At his change of plea hearing, Richardson said that on the morning of Jan. 28, he went into the garage, got some gasoline, lit the couch on fire, and left his home at 10 Vine St., in Ashley. According to the 911 call, Donna Marie Richardson, Christopher Richardson’s mother, was able to leave the house before firefighters arrived, but could not locate her son and believed he was still inside. At the sentencing hearing, prosecutors said Donna Richardson suffered life-threatening injuries in the fire. During the hearing, Donna Richardson attempted to read a statement, but became too emotional and asked a representative from the Delaware County Victim Services Unit to read it for her. Richardson’s attorney Donald Reeder explained to the court that his client attempted and failed to commit suicide in 2011 and suffered a brain aneurysm a year later, leaving him in a diminished state physically. Dawn Counts, a woman who helped raise Richardson while his mother was away, testified that he was not the same after the aneurysm and said she hoped he would get the help he needs. Reeder said that Richardson was bullied a great deal in his youth and just “snapped” on the morning of Jan. 28. “[Donna] doesn’t believe her son was trying to kill her,” Reeder said. After hearing from all the involved parties, Gormley sentenced Richardson to four years in prison for the aggravated arson charge. Gormley placed him on a risk deduction sentence, meaning that he will undergo treatment in prison. Gormley credited Richardson the 180 days he has spent in the Delaware County Jail. Gormley said Richardson also faces five years of post-release control when he completes his prison term. Richardson remained in the Delaware County Jail Wednesday awaiting transportation to prison.